This page is still being rewritten. Some parts of it are still in note form. Life on board the 'Queen of Beauty' for the 96 days voyage from England, while boring and dull at times, also gave a sense of security. With no decision making to do, all meals provided and a group of people all united in the one aim of getting to a new life it was a situation that was far removed from everyday existence. As the ship drew near to Auckland feverish activity would have been engaged in with everything being cleaned and scrubbed so that the rigours of the voyage were minimised. The passengers too would increasingly become excited as their destination and new life came closer and, in preparation for their landing, they were allowed to change into their best clothes. This however was a two edged excitement. On the one hand, hope and anticipation about the new life ahead of them but also, on the other hand, greater realisation about the finality of the steps that had been taken would also begin to dawn and doubts begin to creep in. For some, the arrival could also have been very worrying if the comments by Mr. Farrell, referred to above, were accurate he says " As the Maori war had just started when we arrived many of the young men who failed to join the Volunteer Corps were conscripted and sent to the front" Not, I imagine, the reception from their new country that the Queen of Beauty's passengers would have expected and possibly the reason why David and Helen did not go on to Shortland, as was their original intention, but settled instead in Auckland. Britain had always hoped, and intended, that the colonisation of New Zealand would be humane, because of the influence of the evangelical movement, and would not fall into the pitfalls of exploitation and extinction of the Natives that had marred other colonisation ventures. Sinclair, in his 'History of New Zealand' expresses this sentiment thus; " New Zealand was intended to set the world an example of humane colonization. The ideal was not attained. Race relations soon came to resemble those on other frontiers. That the British Government failed to achieve its expressed desire ' To avoid, if possible, the disasters and the guilt of a sanguinary conflict with the Native Tribes', is no occasion for surprise rather it would be a matter of astonishment if such wars, which seem everywhere to be part of the process of colonisation, had not occured. (p130)"
The seriousness of the situation even two years later can be judged from the information printed in the Local Stirling Press Newspaper two years later about incidents that, fortunately for the Philps, were well away from Auckland. Stirling Journal and Advertiser 7th April 1865 New Zealand war. A British detachment was routed at Waitara, 13 were killed and 33 wounded. Stirling Journal and Advertiser 19th May 1865 New Zealand Natives of Opatiki have taken and destroyed the schooner Eclipse. They hanged and beheaded the Rev. Mr. Volkner, scooped out and ate his brains and then a fanatic priest ate his eyes. Information like this would not, I am sure, encourage the faint-hearted to uproots and go to seek their fortune in New Zealand.!! Exactly what David's employment was in Auckland from his arrival in August 1863 until the following year we cannot, at present tell. Certainly by 1864 he was employed by the Bank of Auckland . The Registration documents for the birth of Helen and David's fourth child Agnes Helen on the 11th of November 1864 lists David as 'Accountant at the Auckland Bank' and record the fact that, at that time their residence was Shortland Street. More than likely the house referred to in Bella Phillips letter to David and Helen prior to their leaving for Auckland. The birth was registered by Helen Philp on the 25th of November 1864 and raises the interesting hypothesis that my original research looking for a town or district called Shortland was based on a false premise arising from the newspaper note in Stirling being in error. Indeed Shortland, as a township, did not exist until 1867 so it is possible that Shortland Street Auckland was their destination from the start. That David should be employed in a bank is not at all exceptional as, we saw above, his whole working life, apart from the few years after the collapse of the Edinburgh and Glasgow Bank were spent in banking. In June 1864, following the success of the Bank of New Zealand, a group of merchants belonging to 'the outer circle' issued a prospectus with a view to setting up a second joint stock bank in the province. In an unpublished article 'Early Financial Institutions of the Auckland Province' By Duncan B. Waterston, 1959, held at the Auckland Public Library we read ; "Incorporated by an Act of the General Assembly, the bank had a nominal capital of �100,000 in 10,000 �10 shares. Ten thousand shares were issued of which 4,000 were taken up by the promotors, 4,000 allocated to the public and 2,000 left in reserve. 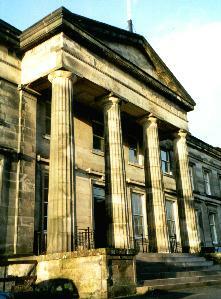 The latter were all placed on the market by 1864. All shares were paid up to one pound. The first Directors of the Bank of Auckland were James O'Neill, president, Edward King, Allan Kerr Taylor, G.M. O'Rourke and henry Isaacs. The bank commenced operations in July 1864 and by July 1866 was considered to be in a sound position, despite the depression which prevailed in Auckland. David Nathan, then President of the bank announced that the bank had made a net profit of �2, 513 over the past six months and that a dividend of 10% would be paid to shareholders. A reserve fund of �1,750 had been created and deposits at the bank totalled �36,734. Six months later the report of the directors was again most optimistic. A further 10% dividend was declared, although this was later reduced to 8% at the general meeting, and it was stated that the bank had purchased the Greyhound Hotel at the corner of Queen and Victoria Streets for its Head office. A branch had also been established at Onehunga." Note. This photograph, provided by Russell Philp,is an early calotype and very feint being about 160 years old. The above is a renovation of that print using modern photo imaging techniques--- Cameron. Onehunga Commercial Directory 1866 lists--- Bank of Auckland, D. Philp. Agent Princess Street In the same Directory and the Advertisement for the bank Charles F. Johns Esq. is listed as being the Manager of the Bank of Auckland. Onehunga is situated to the south some seven to seven and a half miles from Auckland. Now, it is a suburb of the city but in the Philp's time it was a separate town being the port for Manakau Harbour. The above Directory says of the area " The port of Manakau, on the bar of which the lowest tides there is fifteen feet of water is situated seven miles from Auckland, and is the centre of a most fertile tract of volcanic soil. No doubt by its natural position, coupled with the development of the Waikato, for which it is the port of both supply and receipt, and the direct steam communication with Melbourne, which we are in a position to say has been determined upon, will progress most rapidly. Its population numbers about 1000, and a railway is nearly completed from Auckland to it." Clearly it was to the bank in this thriving and developing new town that David turned for employment and for the next three years, despite a recession in Auckland the family, David and Helen, now forty four and forty one respectively with Margaret aged seven, James aged six Andrew aged four and Agnes Helen aged two, must have felt that their fortunes were on the ascendancy. This however was not to last and David and Helen were to experience, yet again, what it was like to be caught up in another bank crash. 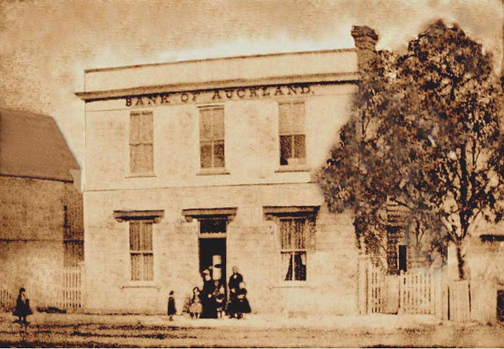 Waterston continues the story of the Bank of Auckland " On the 3rd April 1867, however, it was revealed that the bank was in a perilous condition. the day before the manager, Johns, had attemoted to abscond to Sydney in an attempt to escape the consequences of his actions permitting large advances to be made without adequate security. These advance, amounting in all to over �4,000 were made without the knowledge of the director. Johns had not, however, robbed the bank for his own profit. A run on the bank was avoided by the immediate announcement that the liabilities of the bank would be discharged by the Bank of New Zealand, the Bank of Australia, the Bank of New South Wales and the Union Bank of Australia. The Bank of Auckland was liquidated and its securities taken over by the four banks. Most of the shareholders' capital was lost. The failure of the infant bank to survive the wayward actions of its manager demonstrated that Auckland could not support two locally financed banks as well as several overseas agencies. The capital reserves of the Bank of Auckland were insufficient and the depression ruined any remote chance of reconstructio. Auckland was already staggering under the financial disaster created by the transfer of the seat of government to wellington and the falling off of military expenditure after the conclusion of the Waikato campaign. This bank crash also led to yet another major career move for David----one that eventually took him to Shortland, the place that I thought that they had originally set out for when they left Scotland in 1863. This move is documented by James Philp fifty years later when he wrote his 'Annals of the Philps'. (to be discussed fully in the next chapter) he said " Father went to the new goldfield at Thames which had been opened Aug. 1867. Mother and family joined father at Thames in 1868 after having built a house at 40 MacKay Street, Shortland. " So the world of the Philps was, yet again, thrown into disarray. In the ten years since David and Helen were married in Stirling David was involved in three changes of career, four children had been born and the family had moved to the other side of the world. A decade of stark contrast to the three, relatively quiet, decades that they spent in Scotland prior to their marriage. In 1852 gold, in fairly small quantities, had been found in the Coromandel Peninsula area on the east side of the Gulf of Hauraki and was worked off and on until 1863. At one time it was estimated that as many as three thousand diggers were involved but, on the outbreak of the 1863 Maori war in the Waikato district, the miners were forced to flee their claims and it was not until 1867 that mining recommenced in earnest. The story of Thames, however, really starts in 1864 when James Mackay, Native Assistant Secretary, visited the Hauraki area with orders from the Governor to try to persuade the Maoris to surrender their weapons. While so engaged Mackay learned from the Maoris that gold had been discovered in what eventually became Thames. Later that year Mackay was appointed as Comissioner for the Hauraki district and he tried further persuasion on the Maoris to open up their land and allow gold mining. After considerable dialogue and delay Hanauru Taipari, son of the Paramount Chief, and better known by his adopted name 'Willoughby Shortland' obtained permission for a limited exploration by two Maoris who had gold prospecting experience. They found gold near the Karaka creek and Mackay persuaded the Chiefs to open up their land to the miners. This they agreed to do on the promise of the surface rights remaining with them. On the 30th July 1867 the official proclamation of the Thames goldfield was issued by Daniel Pollen the deputy Superintendent of Auckland and the gold rush that was to lead to the eventual development of the town of Thames had begun. In 'Historic Gold Trails of the Coromandel', Tony Nolan asks us to " Imagine yourself in the booming rumbustious township that was threatening to rival Auckland in size, the rapidly growing conglomeration of tents,shanties, grog shops, hotels, stores, frame buildings and poppet heads that was fast becoming one of the most famous gold towns on earth." Seeing the chaos of the arrangements Mackay took it upon himself to lay out the main street line, Pollen Street, thus from the start Shortland had some system and symetry to it. The influx of miners, and others, was so great and so rapid that the three small, but separate, townships, Shortland, Grahamstown and Tookey's Flat which quickly developed, within a distance of about two and a half miles or so, amalgamated into the one town. Some idea of what Shortland must have been like when David and Helen Philp arrived there in 1867 and 1868 respectively can be found in a description given in a publication intended to give prospective gold miners information about the area called the Thames miners Guide printed in 1868.
" The township of Shortland is exceedingly well laid out, the streets are wide and very numerous, the houses are substantial, and in pollen street tolerably uniform. This is the principal street and it can boast of containing the Court House, Post office, a Custom house (all in a neat one storey building), four banks, a theatre, five hotels, five eating houses or restaurants, a local journal, and stores of all descriptions. There are four churches and chapels (one for each denomination), several small schools, and, to crown it all, an American coach runs between Shortland and Tookeys Flat. The only drawback to Shortland is the mud; literally speaking, you cannot walk along the streets without danger of being swamped." Anyone who has seen the film 'The Piano', set in New zealand about the same time, will have both sympathy with the residents a clear idea of what living with mud was like. That such an organised town developed so quickly is remarkable and suggests that many people other that miners who had diverse interests and skills must have been drawn to the town, as indeed were the Philps. quote population from Miner's guide. Explaining that the Maoris kept the surface rights and leased sites for business and residences Grainger, 1951, says " Most of the newcomers erected tents on these sections and later built raupo whares (huts). In the first few weeks Shortland became quite a canvas town then, as timber became available when a sawmill was started, wooden buildings soon became general. The Rev. Vicisimus Rush the first Vicar of Thames described the scene" At the entrance of the gully there are three large crushing machines which cause a terrible noise, the ponderous beaters, about 24 in all, keep up an incessant thump, thump---night and day" this must be considered as an understatement as J. F. Downey, the mining historian, quoted in 'Historic Gold trails of the Coromandel' p22, lists seven hundred productive mines. For the Philp family the living conditions, in early Thames, were a complete contrast to the Georgian/Victorian lifestyle that we saw David and Helen enjoying when they lived in Scotland. Architect designed, classical, buildings had given way to wooden houses and civilised gentility had given way to a fronteer existence. One can't help wondering how, after three or four years faced with reality rather than dreams, they felt about their decision to seek a new life in New Zealand. Were their any regrets and longing to return to Scotland? David's work as Legal Manager in the Gold Mines. In the Auckland Directories 1866-67 we read that David was a Mining Agent. 1872 Wise's Directory (Slightly different list) Mining Companies p61 Grahamstown and Shortland D.Philp Legal manager unless otherwise stated.